"Burnt offering" redirects here. For other uses, see Burnt offering (disambiguation). For other uses, see Holocaust (disambiguation). Noah burning offerings on an altar to the Lord (Gerard Hoet, 1728). A holocaust is a religious animal sacrifice that is completely consumed by fire. The word derives from the Ancient Greek holokaustos (ὁλόκαυστος from ὅλος "whole" and καυστός "burnt", with rough breathing), which is used solely for one of the major forms of sacrifice. Holokautein (ὁλοκαυτεῖν) is one of the two chief verbs of Greek sacrifice, in which the victim is utterly destroyed and burnt up, as opposed to thyesthai (θύεσθαι), to share a meal with the god and one's fellow worshippers, commensal sacrifice. In the latter, the edible parts of the sacrificed animal were roasted and distributed for festive celebration, whereas the inedible parts were burned on the altar, those being the god's share. Although not actually obliged to do so, Greeks would rather sacrifice a domestic animal to a god or hero and then proceed to use its flesh as food, as animals were thought of as sharing in the sanctity of life - in addition to their secular usefulness (milk, eggs, ploughing). This did not apply to game, fish, and other seafood, which formed a far larger proportion of the diet than they do today – fish was the major foodstuff sold in ancient Greek marketplaces. A sacrifice need not be a public function involving priests and altars; they could also be held privately, domestically or individually. These are the two ideal types of Greek sacrificial ritual; they are appropriate to different divinities, done for different purposes, and conducted by different methods. Holocausts are apotropaic rituals, intended to appease the spirits of the Underworld, including the Greek heroes, who are spirits of the dead; they are also given to dangerous powers, such as the Keres and Hecate. One of the earliest attested holocausts was Xenophon's offering of pigs to Zeus Meilichius. Altars of Incense and Burnt-Offering and the Laver of the Tabernacle (Holman Bible, 1890). When the Hebrew Bible was translated into Greek, as the Septuagint, the translators used the Greek term to translate the "burnt offering" in Ancient Israel. 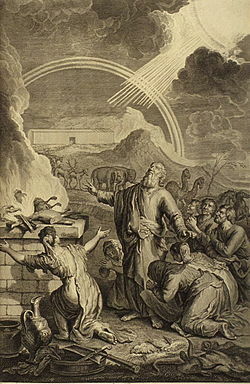 A "burnt offering" (Hebrew: עלה‎, `olah – from the verb "to cause to ascend," hence "burn") is a type of Biblical sacrifice, specifically an animal sacrifice in which the entire sacrifice is completely burnt, consumed totally by fire. 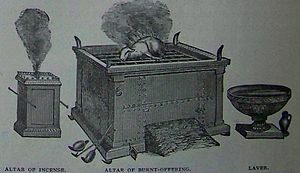 The term "burnt offering" derives from the Septuagint translation, itself deriving from the Biblical phrase "an offering made by fire", which occurs in the description (Leviticus 1) of the offering. This form of sacrifice, in which no meat was left over for anyone, was seen as the greatest form of sacrifice and was the form of sacrifice permitted by Judaism to be given at the Temple by Jews and non-Jews. The whole offering is believed to have evolved as an extreme form of the slaughter offering, whereby the portion allocated to the deity increased to all of it. In slaughter offerings, the portion allocated to the deity was mainly the fat, the part which can most easily be burnt (fat is quite combustible); scholars believe it was felt that the deity, being aethereal, would appreciate aethereal food more than solid food—the burning of the fatty parts of animals being to produce smoke as a sweet savour for the deity. Most biblical scholars now agree that the intricate details of the whole offering, particularly the types and number of animals on occasion of various feast days, given by the Torah, were of a late origin, as were the intricate directions given in the Talmud. Whole offerings were quite rare in early times, but as the ritual became more fixed and statutory, and the concentration of sacrifice into a single sanctuary (particularly after Josiah's reform) made sacrifices quite distinct from simply killing animals for food, whole offerings gradually rose to great prominence. ^ Harrison, pp. 16, 161, et passim; LSJ:ὁλόκαυτος; Xenophon, Anabasis, 7.8. ^ Harrison p. 161; Brill's New Pauly, "Sacrifice"